Rubens Barichello signed Ferrari Helmet Visor Marlboro ! 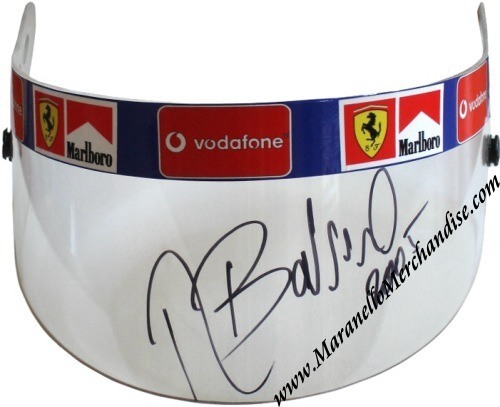 << Back Rubens Barichello signed Ferrari Helmet Visor Marlboro ! Rubens Barichello signed Ferrari Helmet Visor. This is a great (replica!) helmet visor with Vodafone / Marlboro RBS banner that has been autographed by Rubinho in person. Rubens used a black marker for this signature and dated his signature with "2005". Please note that this is a replica visor and not an actual race used visor (would be FAR more expensive if it was) and that it is for display purposes only. Only 1 available of course as every autographed item is unique by nature and we provide a Certificate of Authenticity with it which guarantees that this is a genuine signature.